No Fun For Elephants is a nationwide initiative by ADI in the United States opposing the use of elephants for rides, performances and appearances at public events. At the heart of the campaign is a video narrated by Emmy award winning TV host Bob Barker featuring harrowing undercover footage from inside elephant training facilities in California, as well as abuse of an elephant on tour by a Texas-owned company. Bob Barker introduces the video, "To many, it looks like harmless fun, but elephants pay a heavy price for the few minutes of entertainment they provide when performing in circus shows, giving rides, or making appearances at parades, weddings or other events. Most of us marvel at the majesty of wild animals and I can understand why people want to see animals like elephants up close. But isn’t it especially tragic when animals are suffering and being abused simply to entertain us?" Our “No Fun For Elephants” DVD is being mailed to event organizers across the U.S., including board members of county fairs, renaissance fairs and organizers of town parades, urging them to adopt a humane ‘no elephant rides or performances’ policy, in view of the suffering these animals endure. ADI also highlights the risks to public safety by the way that just lightweight rope, tape or fencing is used to contain these large and stressed animals while they are in public. ADI’s information pack shows board members of county fairs, renaissance fairs and organizers of town parades and other events, that if they hire these elephants for rides for the public, they are supporting cruelty. The campaign is the first major push to event organizers across the U.S.
For the first time, fair boards and town parade/event organizers have actual evidence of the brutality suffered by these animals behind the scenes, in order to make them compliant for public performances. ADI is asking fair boards, town parade and event organizers to make a formal policy that they will not provide elephant rides or appearances at their event in future. Elephant rides have recently been abandoned by the boards of several events after viewing ADI evidence, including the Orange County and LA County Fairs and Santa Ana Zoo, illustrating how, if event organizers are given the facts and understand the cost to the animals, they will say “no” to the suffering. Jan Creamer, ADI President: "We believe that once people see how these animals suffer behind the scenes, they will not endorse such cruelty. We realize an elephant walking around a small enclosure giving rides looks like a bit of harmless fun, but it takes a vicious training regime to get these wild animals to be so quiet and compliant in public. We know that event organizers will be shocked and will agree that these rides and appearances bring shame on their event." As Bob Barker concludes: "It really isn’t harmless fun, and it’s time it stopped." -email usa@ad-international.org to get involved! April 6-May 27, 2019: Elephant ride outreach at the Scarborough Renaissance Festival. June 15-Aug. 4, 2019: Elephant ride outreach at the Colorado Renaissance Festival. Aug. 17-Sept. 29, 2019: Elephant ride outreach at the Minnesota Renaissance Festival. 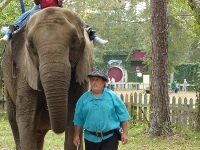 Aug. 24-Oct. 20, 2019: Elephant ride outreach at the Maryland Renaissance Festival. Oct. 5-Dec. 1, 2019: Elephant ride outreach at the Texas Renaissance Festival. Kansas City Renaissance Festival cancels elephant rides!